Following a few highly successful days fishing on his Fly fishingThailand holiday UK Fly fishing fan Eric travelled to IT Lake Monsters. On arrival at the lake Eric began expertly casting his flies towards the many predators showing out in the centre of the lake. Eric began the mornings fly fishing using an assortment of DNA mackerel patterns and EP Tarpon flies. The UK fly fishing fan steadily bagged monster fish throughout the morning landing a succession of hard fighting Asian Redtail Catfish and Amazonian Redtail Catfish to an estimated 25kg’s. Fishing his carefully presented fly fishing presentations hard on the bottom with a slow retrieve accounted for the majority of the angler’s fish which all fought every inch of the way to the net. The highlight of the morning’s Thailand fly fishing was a beautiful Spotted Sorubim of 18kg’s which tested the angler’s medium weight fly outfit to its absolute limit! After breaking two of his fly rods on unseen monster fish the highly skilled fly fisherman combined the unbroken sections to create a new makeshift fly outfit and changed over to closer range surface tactics. After a change over to bread flies Eric also hit into a succession of aggressive Alligator Gar landing several good sized fish and losing plenty of others. The bread flies seemed to also catch the attention of the hungry Pacu which homed in on his carefully presented flies seeing the angler successfully land half a dozen decent sized fish. After changing over to bait for the afternoon Eric continued to catch a succession of Redtail Catfish before hooking something much larger. 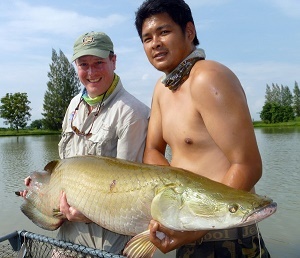 After casting out a large mackerel fillet a super fast pick up saw the angler setting the hook into a monster Arapaima. The Arapaima savagely breached the water angrily shaking its head before the hook was shaken clear of its mouth! After recomposing himself Eric continued fishing with mackerel fillets at various points around the lake. After a quiet twenty minute spell another smaller Arapaima picked up his deadbait and charged off across the lake. On this occasion Eric’s hook held firm and after a short but highly energetic battle a 40kg fish was brought to the recovery cradle at the lakeside. The Arapaima was allowed a short period for recovery before trophy shots were taken and the predator was released.